“Unity” is the Syrian opposition’s buzzword in the countdown to the April 1 “Friends of the Syrian People” meeting in Istanbul. -- The Syrian National Council (SNC) is inviting all Syrian opposition factions, including disaffected members, to agree a “National Pact for the New Syria” in two days of talks opening tomorrow, Monday, in Istanbul. -- And the Syrian Muslim Brotherhood is preparing to issue later today a manifesto proclaiming a new National Covenant. Brig. 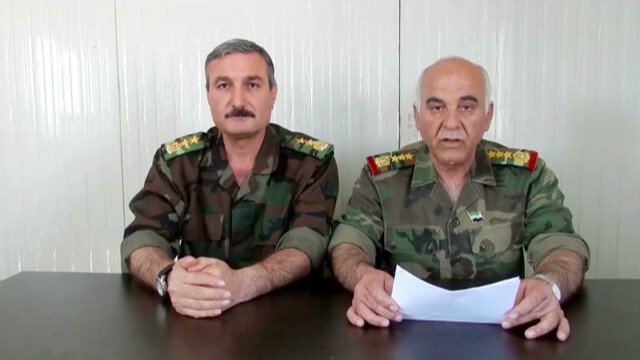 Gen. Mustafa Sheikh, one of the first high-ranking officers to defect from the Syrian Army, said in a video posted Saturday on YouTube that armed rebel groups have aligned under the leadership of the Free Syrian Army (FSA). FSA commander Col. Riad al-Asa’ad appeared next to Sheikh in the video. "First, we decided to unite all the military councils and battalions and all the armed battalions inside the country under one unified leadership of the FSA and to follow the orders of the commander of the FSA, Col. Riad al-Asa’ad," Sheikh said. Second, with the FSA serving and protecting Syrians, "any movement to carry out a military operation or do anything outside the framework of the FSA "will be held responsible for any act they carry out," Sheikh warned. Third, soldiers and officers in the Syrian armed forces "who don't have blood on their hands" are urged to defect and join FSA ranks. Sheikh's appearance with al-Asa’ad also mended rifts between the two main defectors' groups, the FSA and the Higher Military Council. Al-Asa’ad will lead all FSA field operations, while Sheikh will remain head of the Higher Military Council and will represent the FSA in trying to get weapons and international support.